News media brought the “Great Pacific Garbage Patch”—the famous swirling gyre of plastic pollution in the ocean—into the public consciousness. But when Marcus Eriksen cofounded the 5 Gyres Institute with his wife, Anna Cummins, and set out to study the world’s oceans with hundreds of volunteers, they discovered a “plastic smog” of microscopic debris that permeates our oceans globally, defying simple clean-up efforts. What’s more, these microplastics and their toxic chemistry have seeped into the food chain, threatening marine life and humans alike. 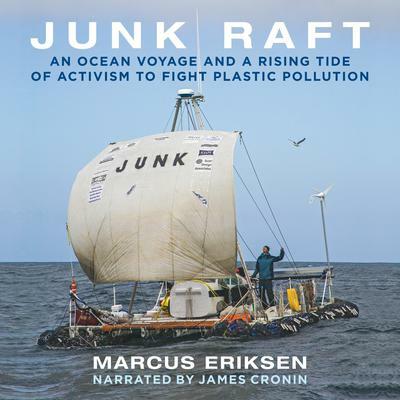 Far from being a gloomy treatise on an environmental catastrophe, though, Junk Raft tells the exciting story of Eriksen and his team’s fight to solve the problem of plastic pollution. A scientist, activist, and inveterate adventurer, Eriksen is drawn to the sea by a desire to right an environmental injustice. Against long odds and common sense, he and his co-navigator, Joel Paschal, construct a “junk raft” made of plastic trash and set themselves adrift from Los Angeles to Hawaii, with no motor or support vessel, confronting perilous cyclones, food shortages, and a fast decaying raft. But, as Eriksen shows, the tide is turning in the battle to save the world’s oceans. He recounts the successful efforts that he and many other activists are waging to fight corporate influence and demand that plastics producers be held accountable. Junk Raft provides concrete, actionable solutions and an empowering message: it’s within our power to change the throw-away culture for the sake of our planet.